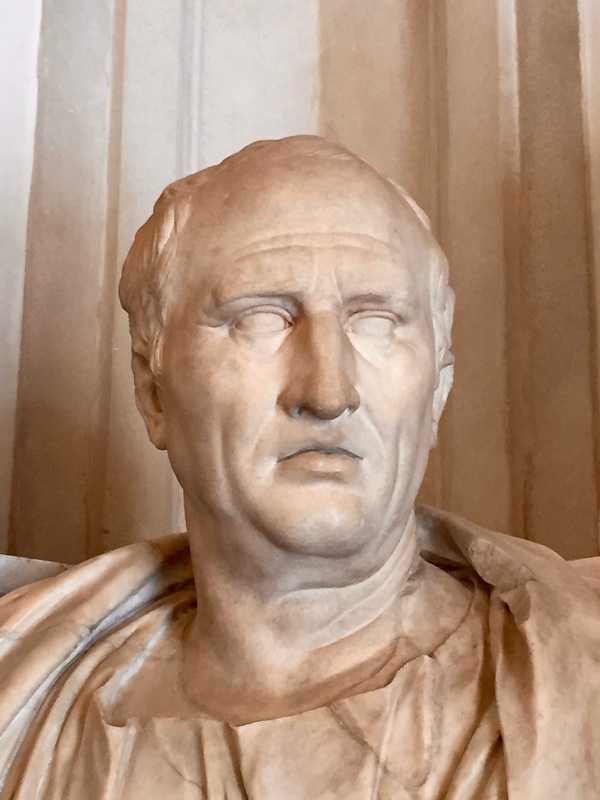 I have written about book III of that treatise, where Cicero engages in a fictional (I assume) dialogue with Cato the Younger — who was indeed his friend and political rival in real life — and asks him to lay out the basics of Stoic philosophy. (See here and here.) Book IV, then, is Cicero’s response to his friend, and it is hardly friendly. Ouch. And there is more, much more, in that vein (a few additional examples below). Still, what’s the substance of Cicero’s reaction? At IV.8 he claims that “the ancients,” by which he meant largely Aristotle — who had lived only two and a half centuries earlier — had pretty much finished with the subject of logic. This is demonstrably false, of course, not just because logic is still today, two millennia after Cicero, a thriving and innovative branch of philosophy (he couldn’t have known that), but more pertinently because the Stoics are recognized as the originators of a more complete and sophisticated system of syllogistics than the Aristotelian one, a system that anticipated aspects of propositional logic that would eventually find center stage with Frege in the late 19th and early 20th centuries. At IV.11, Cicero raises the same complaint about natural philosophy (i.e., science), which he claims had already been well charted by both the Aristotelians and the Epicureans. There is no doubt that Aristotle’s (but not really Epicurus’) contributions to early science were fundamental. But the Stoics did write a number of treaties on scientific topics, ranging from biology to astronomy, and of course science is a collaborative, open ended project, so that no particular school could ever claim the final word on it. More importantly, though, I think Cicero underestimates just what the role of “physics” (i.e., natural philosophy and metaphysics), and for that matter also of “logic” (i.e., logic, epistemology, rhetoric) was for the Stoics. They saw both disciplines as worth pursuing not for their own sake, but in order to arrive at a better understanding of the third topos, ethics, i.e., how to live one’s life. So Stoic natural philosophy was definitely subordinated to their ethics, unlike in Aristotle (but, come to think of it, very much like Epicurus). It was an instrumental, not focal, concern. It is at IV.14-15 that things really get heated, when Cicero sarcastically inquires of Cato what, exactly, the Stoic contribution to the crucial topic of ethics have been. Cicero maintains that the third interpretation is in tension with the other two, and that moreover it is just what Aristotle prescribed, since it depends on externalities such as wealth, health, education and so forth. It’s not clear where Cicero gets the second and third interpretation (the first one is Zeno’s), but even so there does not seem to be either a contradiction here or a call for the necessity of external goods. If natural causation (first interpretation) has decreed that I be poor, I will be, which will not preclude me from performing my duties as a human being (second interpretation), and which will still lead — according to the Stoics but not the Peripatetics — to “enjoy” life in accordance with nature, meaning following the facts as they result from concatenations of cause and effect. There is much more along the same lines that follows, but it is worth pausing here and realizing that Cicero is either not understanding, or is rejecting without argument, what is arguably the core of Stoic philosophy, the distinction between worthy and unworthy things (virtue and vice, related to one’s conduct) and preferred and dispreferred ones (all the externals). To see this, recall the difference among Aristotelianism, Cynicism, and Stoicism, as understood by modern scholars such as John-Stewart Gordon. To simplify a bit, Aristotle maintained that eudaimonia requires not just the practice of virtue, but also a good deal of externals, particularly health, wealth, education, and a bit of good looks. The Cynics, by contrast, had argued that externals are entirely irrelevant to the good life, which is founded exclusively on the practice of virtue. We can see these as respectively the aristocratic and the ascetic extremes of a range of eudaimonic philosophies. The Stoics — whose school originated after both Peripateticism and Cynicism, and thus built on both, as well as on their common source, Socrates — struck what I think is a happy compromise: all that is needed for a worthy life is the moral dimension, i.e., the practice of the virtues. But, so long as they don’t interfere with virtue, some externals can be actively pursued while others can be actively avoided, thus leading to the notion of preferred and dispreferred “indifferents,” indifferent, that is, to one’s moral worth. Stoicism, in that sense, achieved the best of both (the Peripatetic and the Cynic) worlds: one doesn’t need to be wealthy, educated and so forth in order to be moral (and indeed, one can easily go off the virtuous path in the pursuit of externals), but if one happens to be healthy, educated, and so forth, this is good and in fact facilitates one’s practice of the virtues, because a wealthy and educated person can do much good in the world. To be chosen, but not to be desired, is a concept that applies to all circumstances not under one’s control, including of course things like health, wealth and education. That is what makes them both “preferred” and “indifferent,” with no sophistry or contradiction implied. When Epictetus is explaining how if something is out of our control he says we should say “It is nothing to me”. Now if something is nothing then how can one decide rationally to chose it or not to chose it? Again, if everything out of our control has the same value (0) then how can we use reason to chose one thing over another– it’s indifferent. You may be taking Epictetus too literally. “It is nothing to me” doesn’t literally mean nothing, otherwise it would make no sense, as you say, to talk about preferred indifferents. In part II (out tomorrow) I will explain more fully. What Epictetus is saying is that if something is out of our control we shouldn’t waste our time worrying about it. In the original language, “it is nothing to me” has the idiomatic meaning “I don’t concern myself with it.” An example would be worrying about whether you are about to be killed by a falling meteorite (at least before we had spacecraft that might be able to prevent it). Worrying about that would do no good at all, so we shouldn’t concern ourselves with the possibility. Cicero, you silly goose! Don’t you know that extinguishing all enthusiasm is the whole point of Stoicism? Perhaps (only perhaps) Cicero has a point here. The amount of motivation a person has (or feels) may change when she moves from the purpouse of obtaining x to the purpouse of ‘doing everything in her power to obtain x’. Any thoughts on this? At the end, this seems to be an empirical question (with its obvious difficulties). Well, the Stoics held to a developmental theory of virtue, meaning that one becomes more virtuous with training and improvement to her sense of agency. And since their idea was that one needs to control negative emotions but to foster positive ones, they did believe in positive feedback between reason and emotion. That’s why Stoicism inspired CBT and similar type of rational-emotive therapies. What I seek out in life simply is to be loved and to have fun with the least bit of stress. This interpretation says just that, to enjoy life to the fullest extent as it comes naturally. To me this means, to live life with indifference and not to fight against the natural flow of events that happen in your life. To just accept things as they happen. To me this means to live life the easiest way, the best way you know how, by doing what comes most natural to you. In other words, do not challenge yourself, find what you are good at, and stick to it. All three interpretations in my opinion links to the original statement “live according to nature”, the one I prefer to live by if I had a choice however, is the third one. I actually think the three interpretations of “follow nature” are less at odds with each other than Cicero thought. At any rate, my favorite ancient version of it is most closely associated with Seneca, and it basically means to apply reason to social living (because humans are naturally capable of reason, and they are social animals). Becker’s modern version, “follow the facts” (and don’t engage in wishful thinking) is also good.